Janus’s two faces are looking into the past and towards the future at the same time. We, at Janus Vineyard and Tasting Room have respect for the past yet dare to be fresh and new. Wine is a medium that connects the past with the future, tradition with renewal, people with people… We at Janus Vineyard work to produce wines that are sophisticated and refined enough to function as a mediator and represent the Villány wine-region throughout world. Our newly planted vineyard is located in the western border of the Villány wine-region and all of it’s 12 hectares are capable of producing DHC (Districus Hungaricus Controlatus) Villány Premium Quality wine. The grapes we grow are representative of the region and our taste: Portugieser, Pinot Noir, Merlot, Cabernet Franc, Cabernet Sauvignon, Shiraz, Sauvignon Blanc, Muscat Lunel. 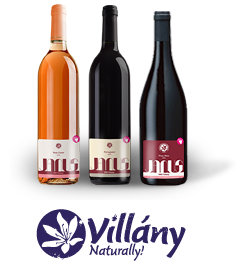 The wines made from the 2007 virgin harvest are now aviable in our Tasting Room and in several wine stores in Hungary.